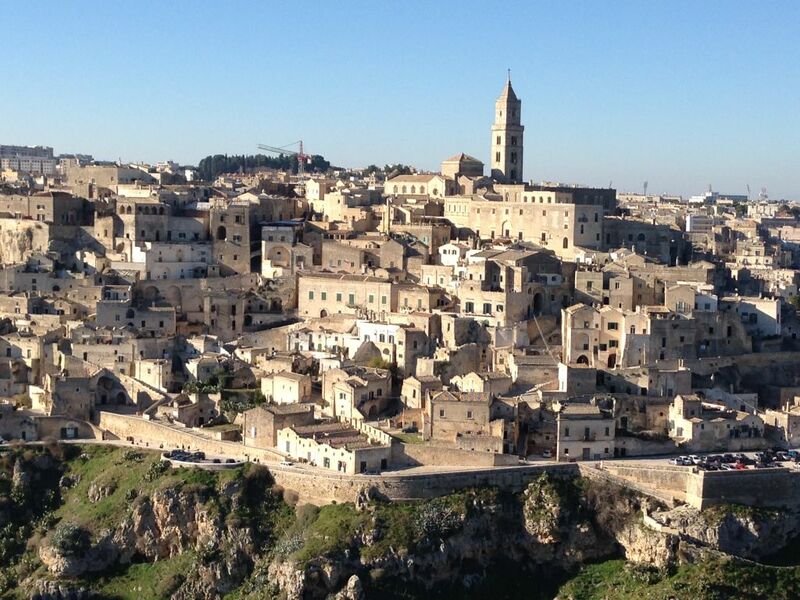 Matera, the town of the “Sassi”, today is a perfect mix between culture and fun, so it is an ideal place to live in. 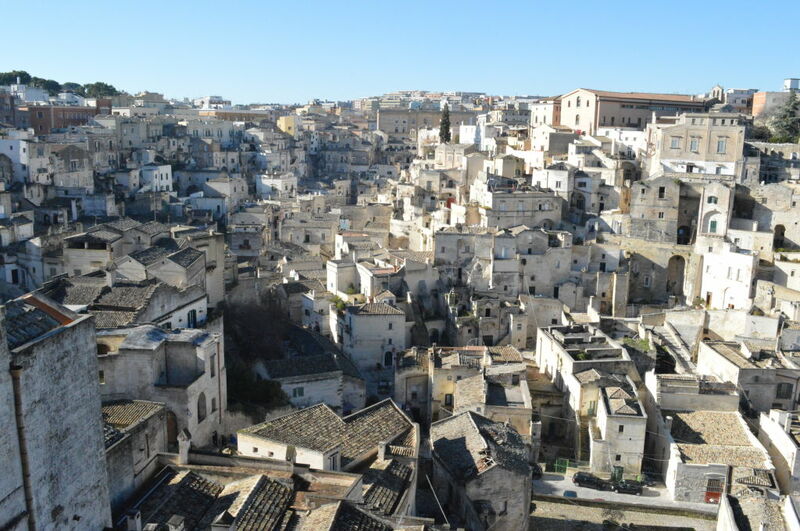 You can easily move on foot to different areas of the town; the temperament of the people of Matera is welcoming and hearty and the cost of living is not high, if compared to other cities. 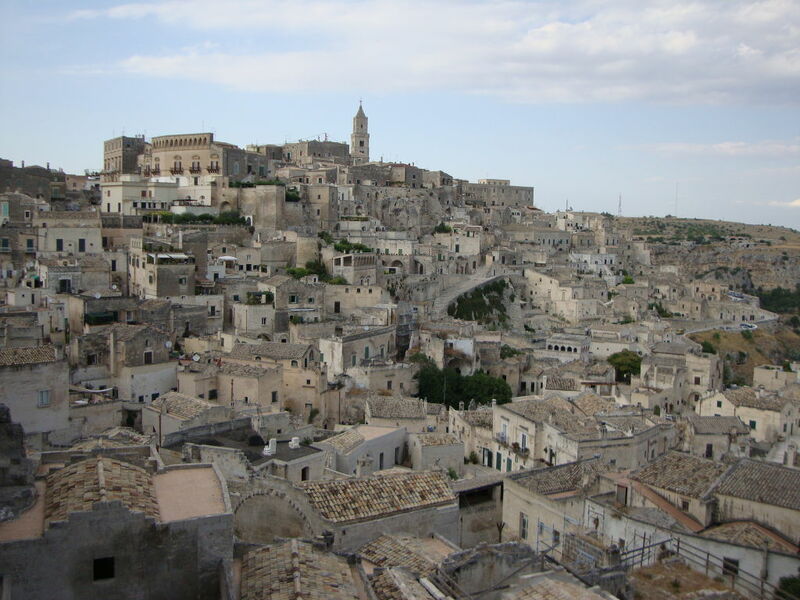 Over the years, tourism in Matera has changed a lot and nowadays more than a mass tourism, in Matera there is a cultural tourism. 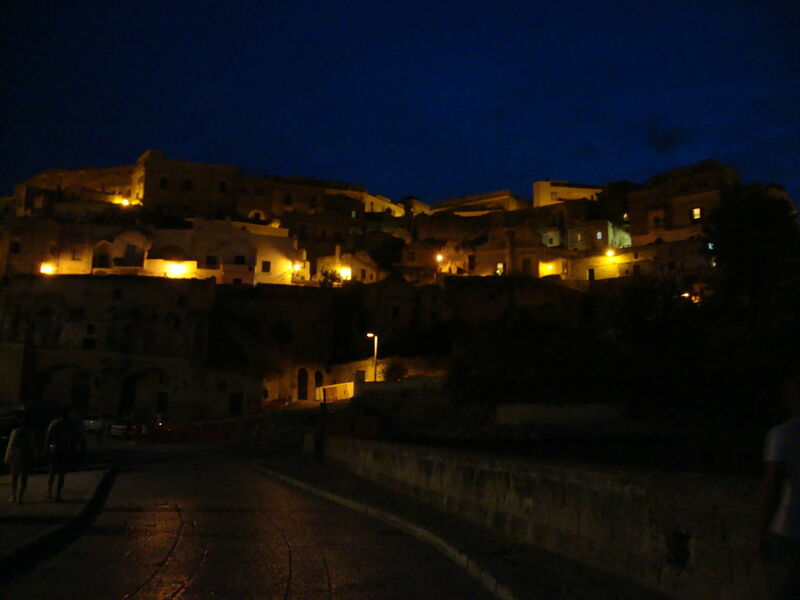 The “Sassi” represent the old part of the city: they developed around the “civita” and they form an entire town, made of cave-houses dug in the calcareous rock itself (the rock is locally called “Tufo”): it represents an articulated housing system, perched on the slopes of a deep valley, called “Gravina”. Elegant and articulate structures alternate with underground labyrinths and cavernous mazes, creating a unique landscape of great effect. 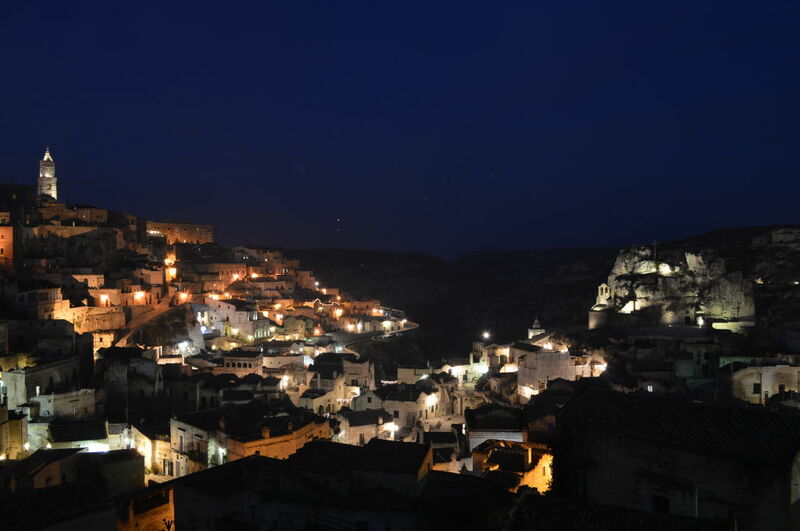 Once a heart of the peasant civilization, today the “Sassi” – restored and furnished – come back to life and the leave you breathless, especially at night, when the small lights from the houses, restaurants and workshops, make them look like a papier-mâché nativity scene. 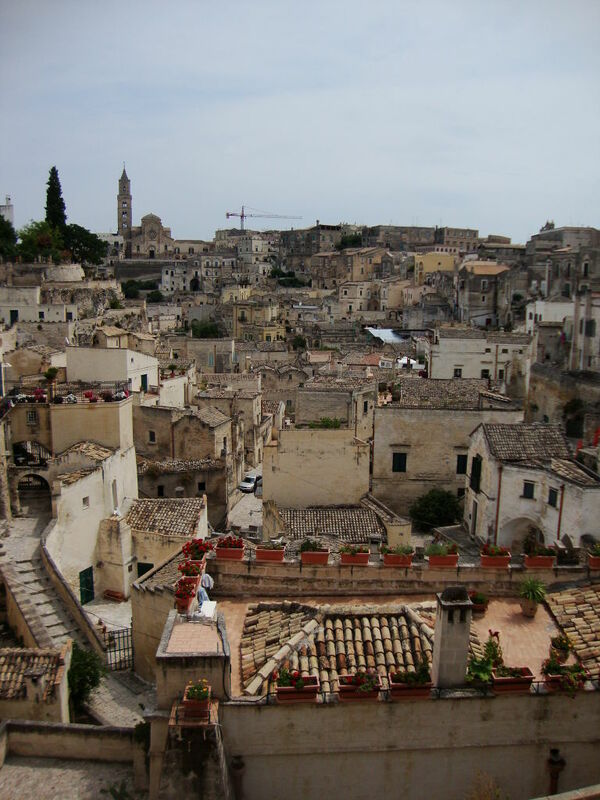 The “Sassi” are made up of 2 main areas: “Sasso Barisano” and “Sasso Caveoso“, divided in the centre by the “Colle della Vita”, the oldest settlement of the town of Matera and the heart of the medieval urbanization. 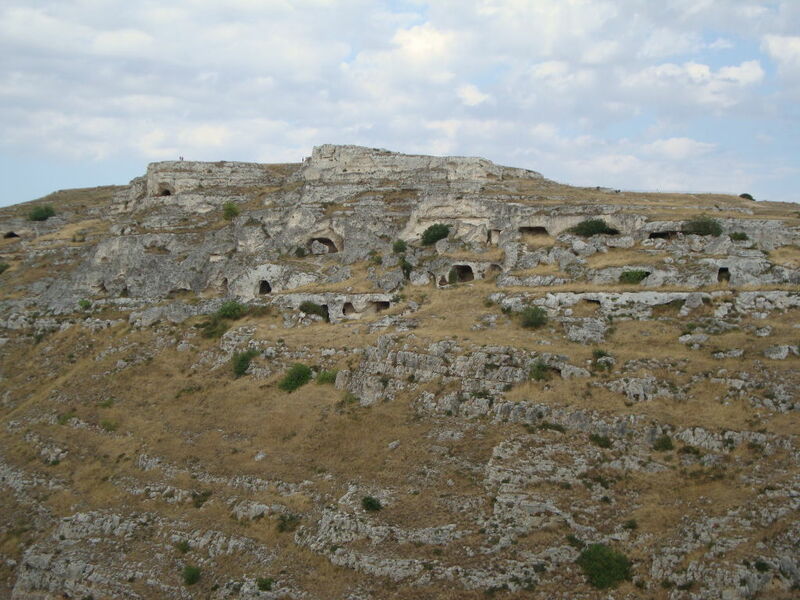 “Sasso Caveoso” is characterized by an ancient look: it is mainly made of old houses dug in the rocks and basically remained untouched. 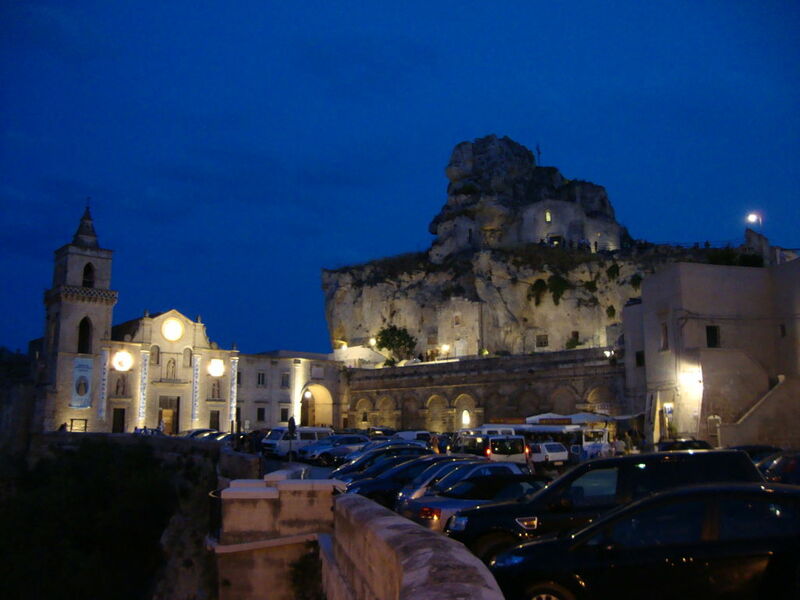 The square, which has the same name of the area, with the Church of San Pietro Caveoso, allows people to admire the amazing panorama of the Gravina and the row of houses and caves clung one above the other. 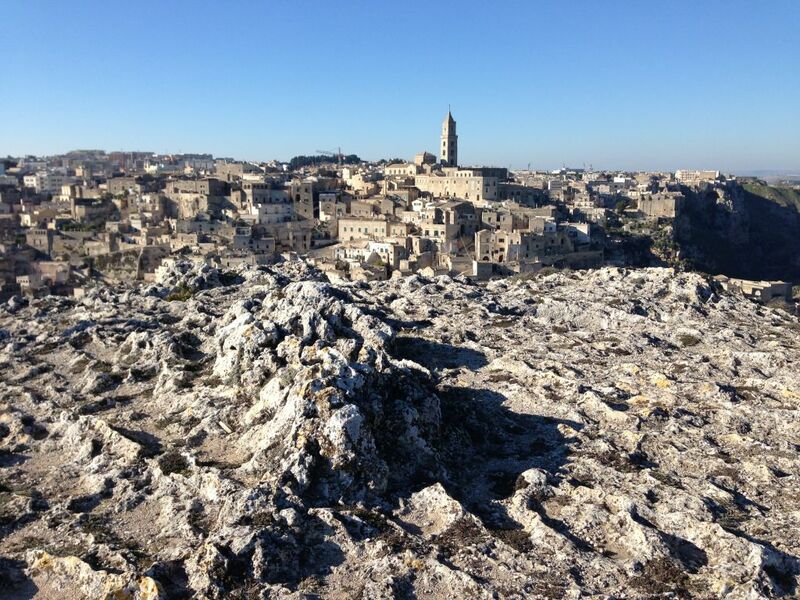 Walking along Via Madonna delle Virtù, passing by the Gravina, you can reach “Sasso Barisano”, so called because it looks towards the city of Bari (placed in region Apulia). 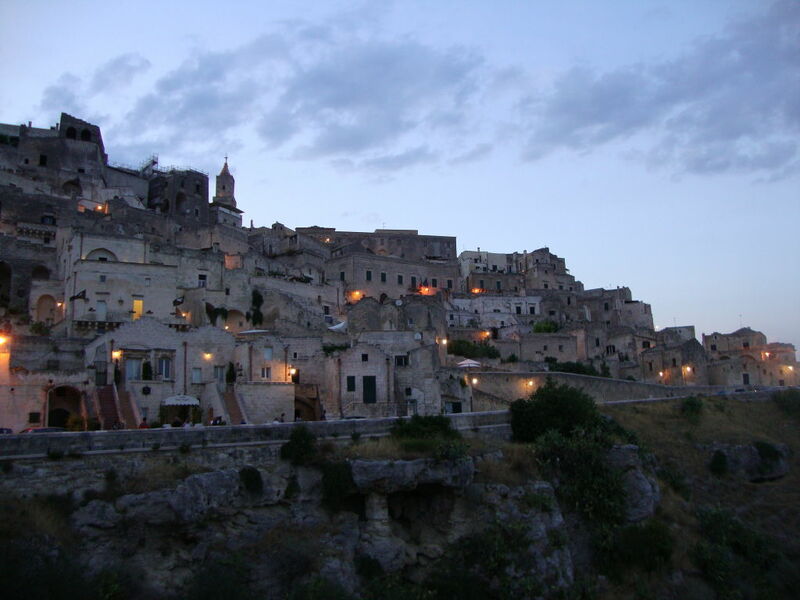 If in “Sasso Caveoso” you can mainly see houses, “Sasso Barisano” is currently almost fully restored and it is mainly characterized by lovely restaurants and hotels, together with tourist attractions like a miniature of the “Sassi” and the Museum of the Peasant Civilization. 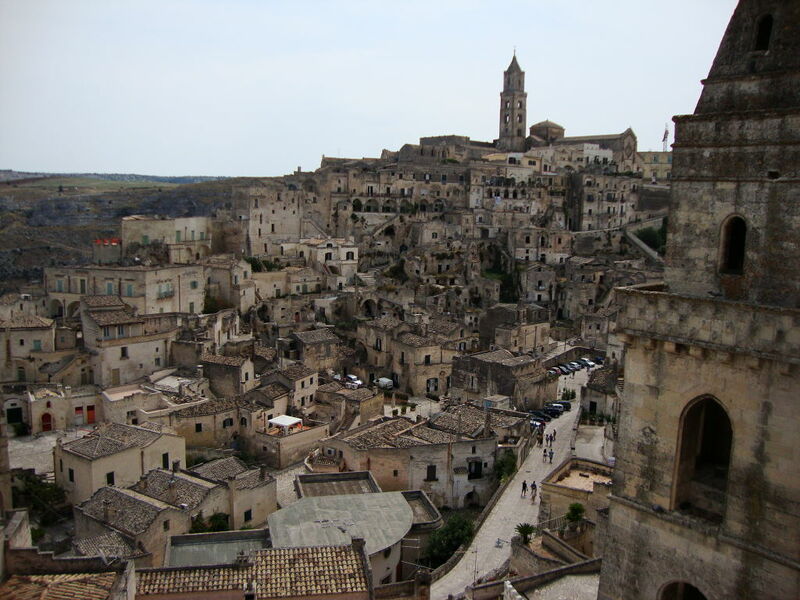 This area is placed North-West to the “civita” and, with its 2 parishes (San Pietro Barisano and Sant’Agostino), it had a population comparable to that of “Sasso Caveoso”, although “Sasso Barisano” is definitely smaller. 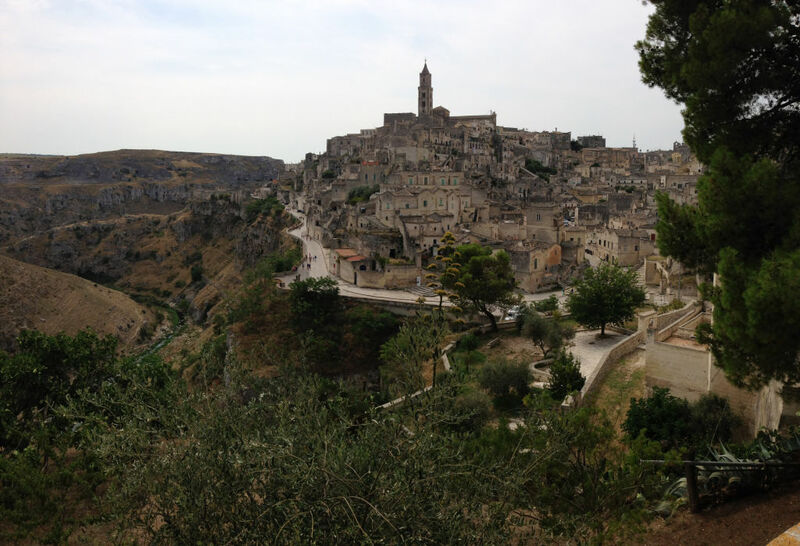 Our trip in Matera (actually we went 3 times, because every time we travel South, we can’t help stopping by!) which is a UNESCO World Heritage Site since 1993, started from Piazza Vittorio Veneto, where after visiting the Church of San Domenico, we lean to the terrace to overlook an amazing preview of what we are going to see in detail: very narrow alleys, with steep staircases made of stones, amongst a labyrinth of houses in “tufo” stone, all extremely close to each other in a harmonious disorder, balconies and hanging terraces. In front of all this, the Cathedral dominates. 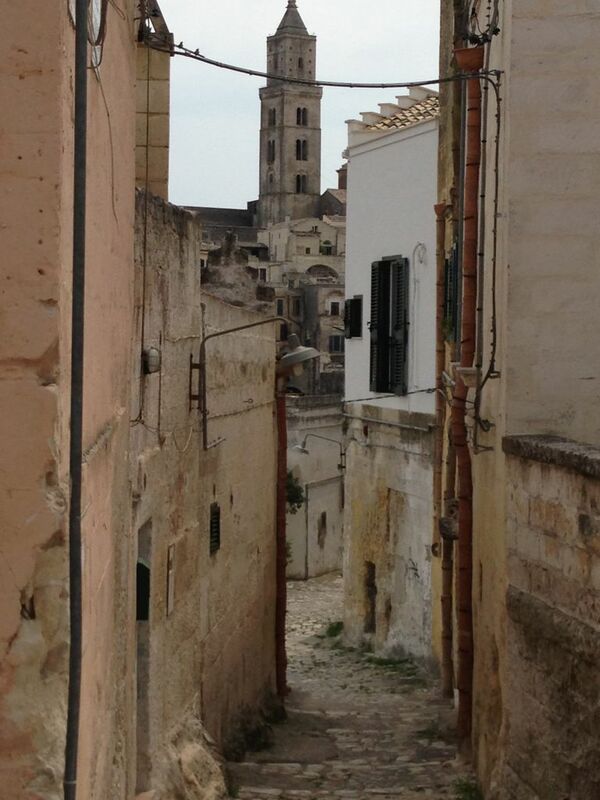 We start walking through Via San Biagio, where buildings from the XVII century stand. 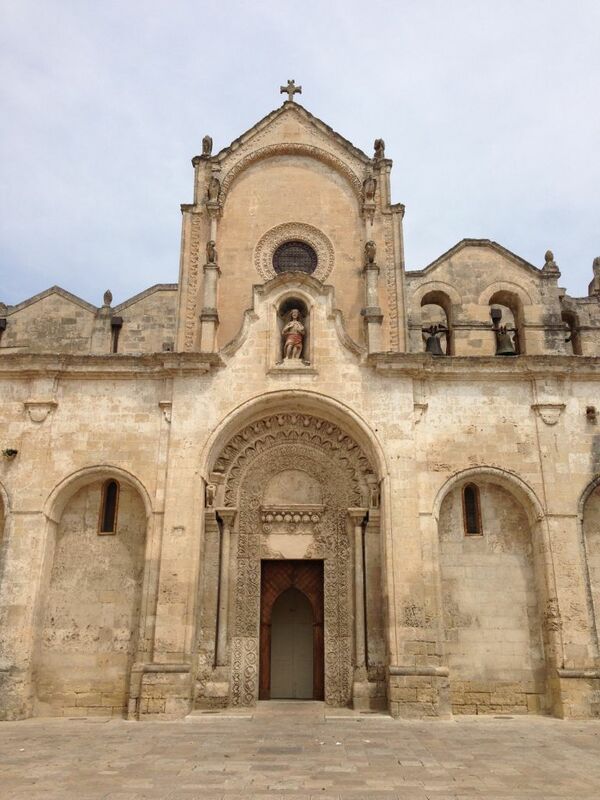 We come across the first churches and we stop by the medieval Church of San Giovanni Battista. We continue our walk downhill towards the Monastery of Sant’Agostino, from which you can clearly see the spur, where the Duomo stands. 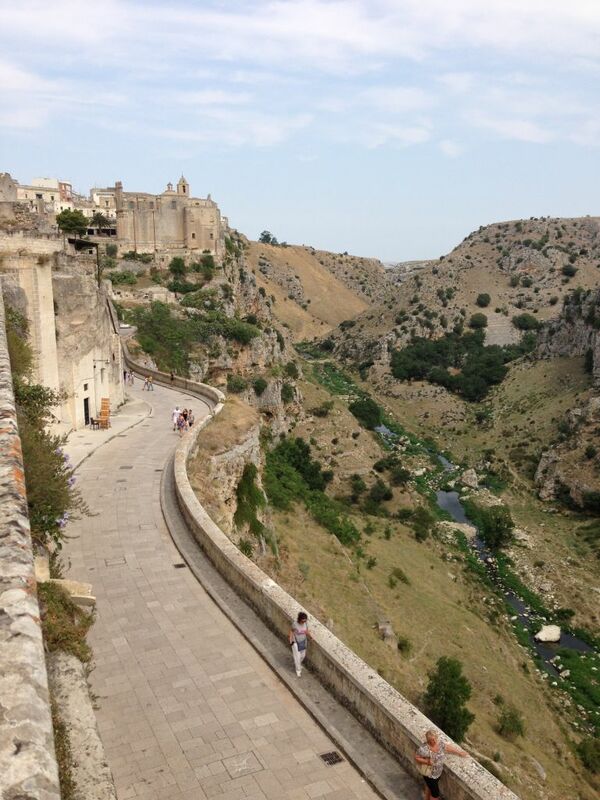 We further walk dowhill, walking beside the Gravina: this panoramic road, leads to the “Sasso Caveoso”, the more primitive one. 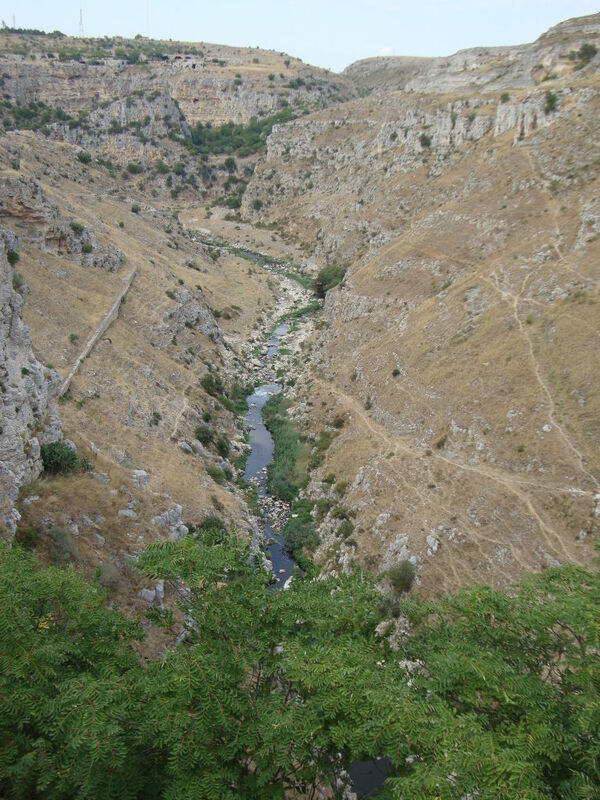 This path gives us a great vision of all the caves, once inhabited by eremites, and of the small churches dug in the rock, which are spread here and there along the ridge, where Mel Gibson decided to shoot the movie, which won the Oscar, “The Passion”. 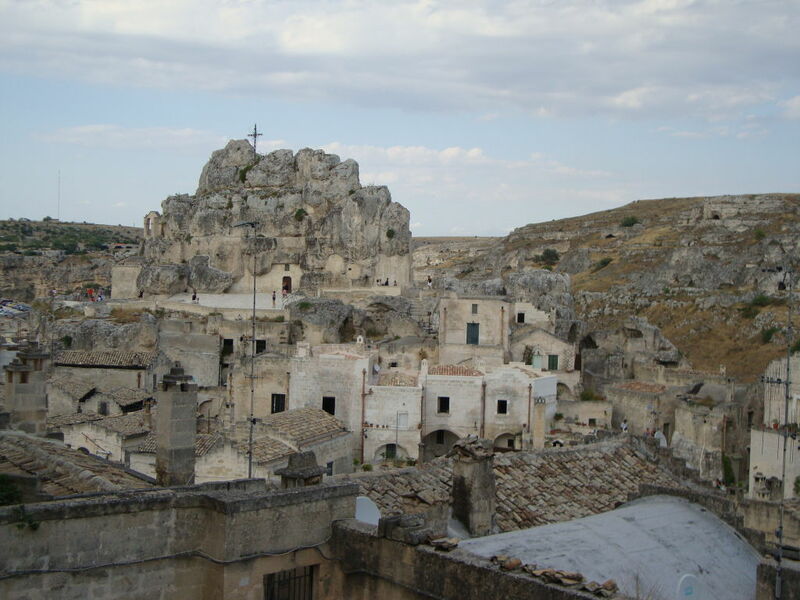 After this relaxing walk, which fills our eyes and heart with emotions, which are hard to be described, we reach Piazza di San Pietro Caveoso, with its church clung on the side of the Gravina. 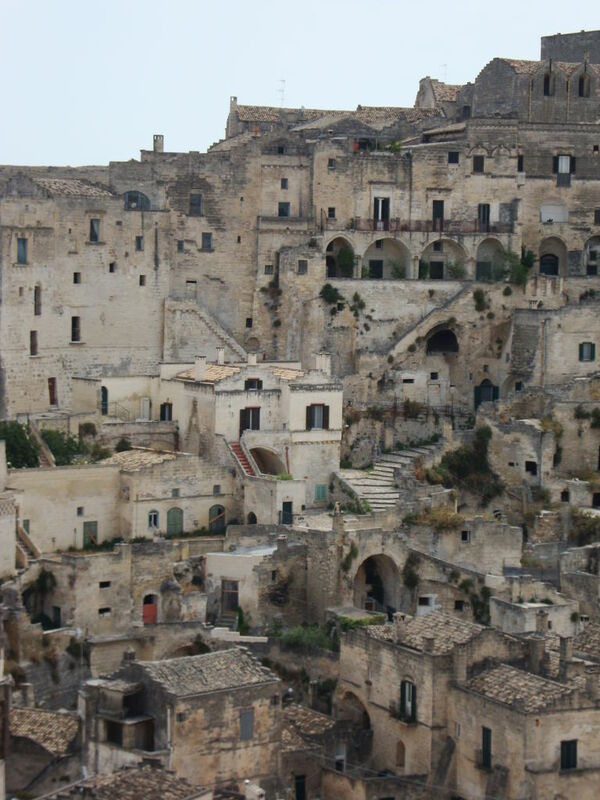 From here, it is possible to admire, from one side, the houses, which are set in an amphitheatre shape, sloping down; from the other side you can see houses, which seem to be set one over the other and, right in the middle, a spur of rock which embraces a church. We walk through an arch and we find a world, which is even older and mysterious, an unreal town, which developed secretly. 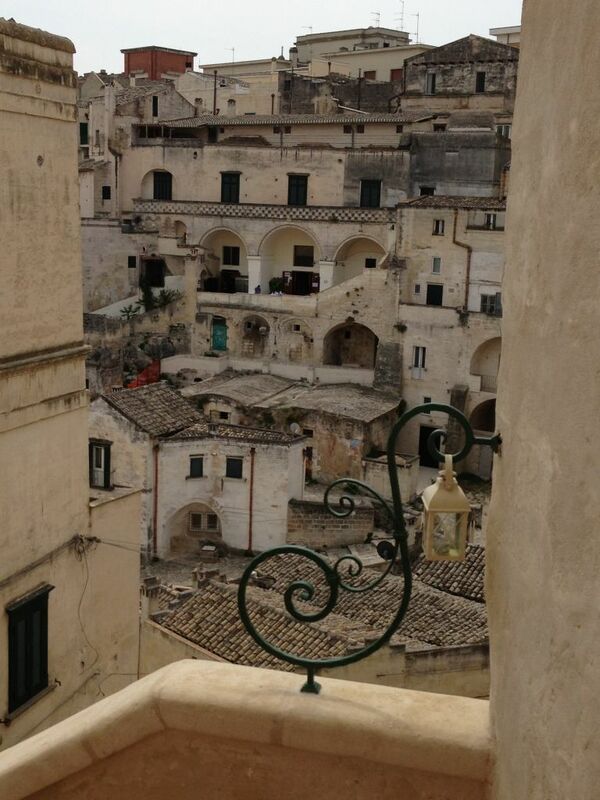 Luckily, we have the chance to visit a “Casa-Grotta”. 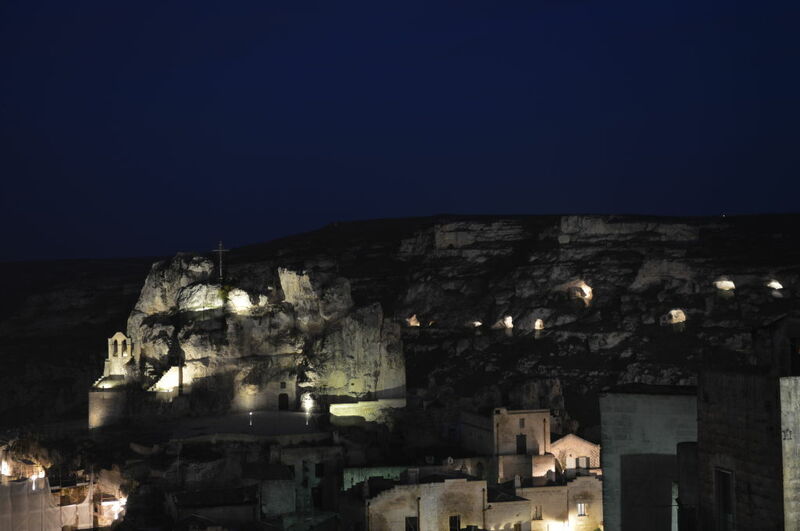 It is a typical house dug in the rock of “Tufo”, which has been totally furnished as it used to be originally. 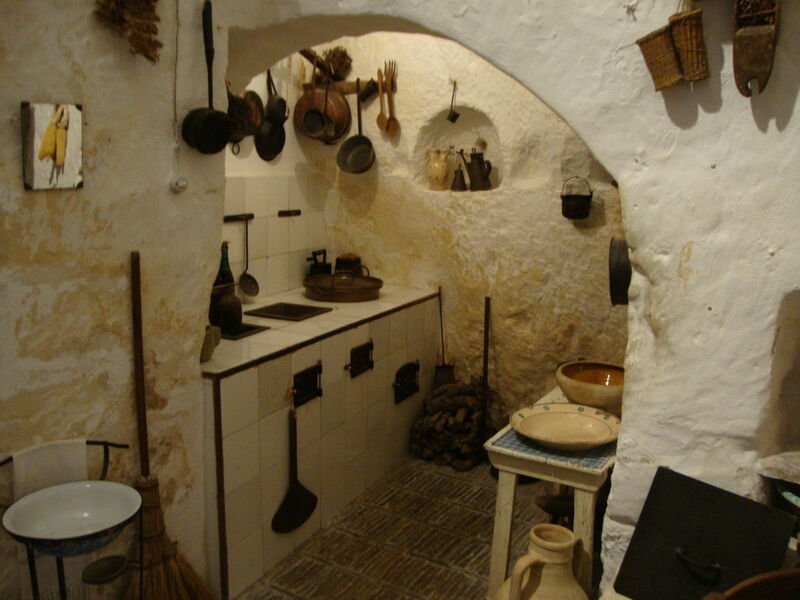 The cave-house consists of 2 rooms only, where 11 people + animals used to live in, in hygienic and sanitary conditions really unbelievable. 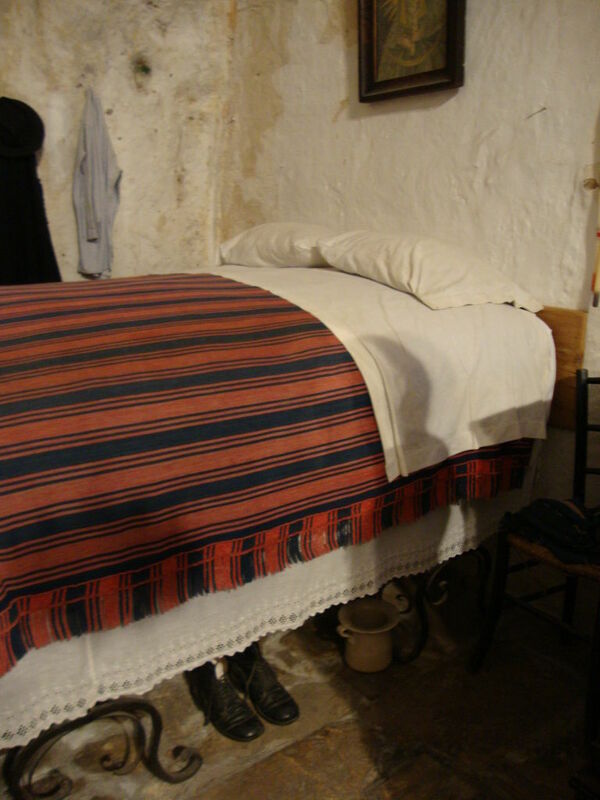 Everything was made in the house: they ate, slept, cooked and worked; kids used to sleep inside the furniture drawers and the bed was very high, so that hens could sleep below. 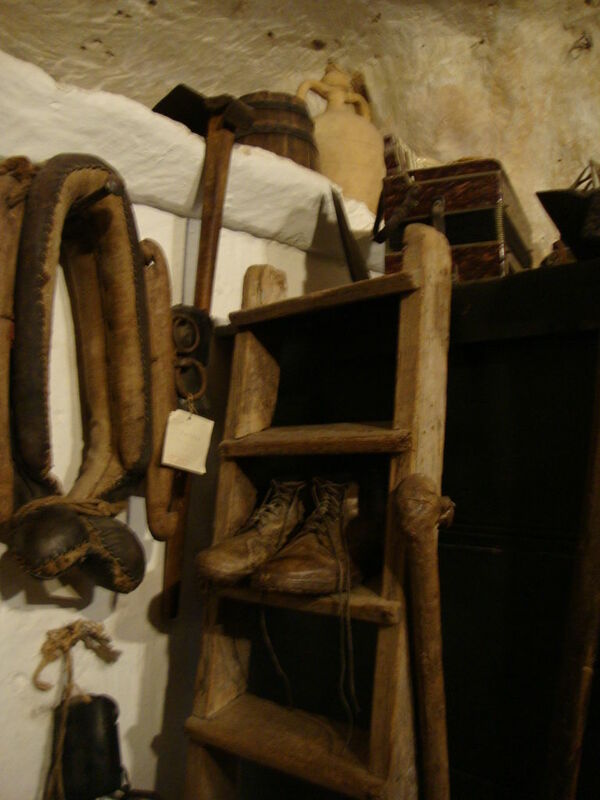 At the bottom of the cave-house, there is a further room, where other animals, donkeys mainly, were kept. 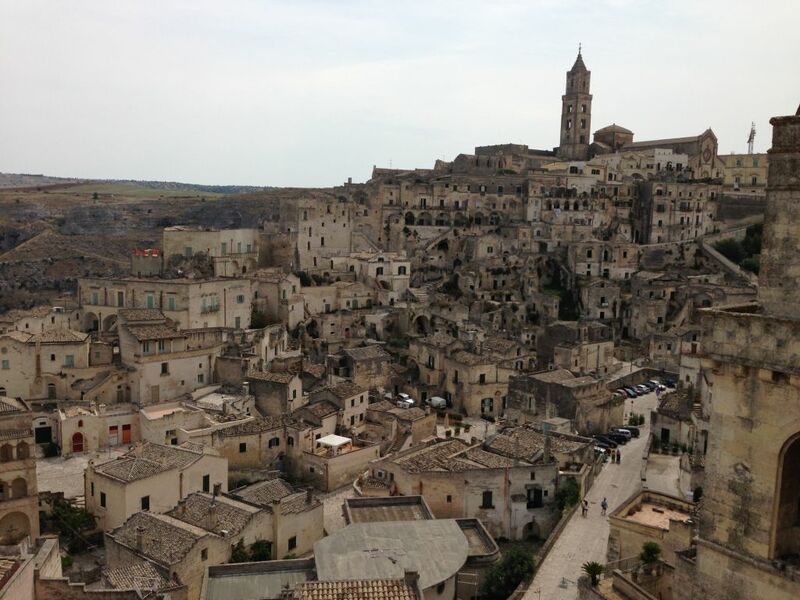 It is a great example of organization and frugal living, but this is also the reason why, during the ‘60s, the Italian Government forced families to get out of the caves and move into proper houses. 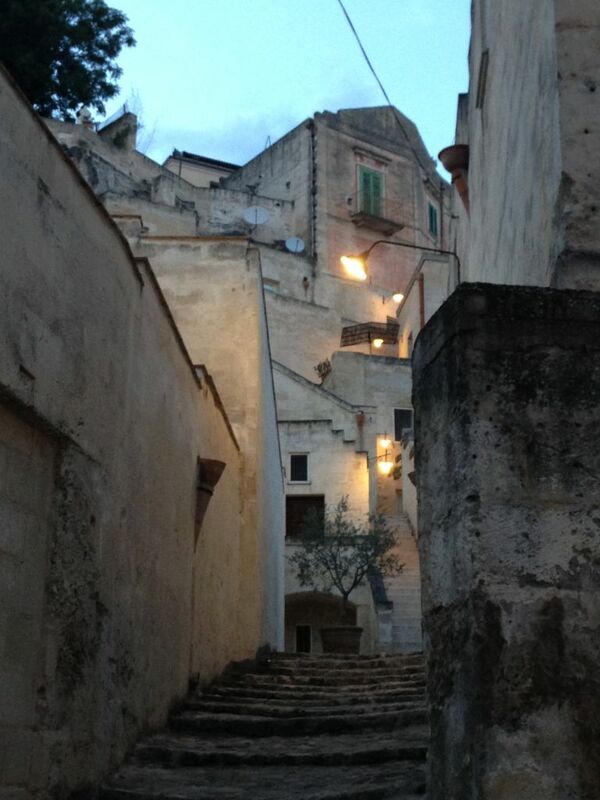 Walking up the staircase, we reach the top of Monterrone, where an amazing cave-church is placed. 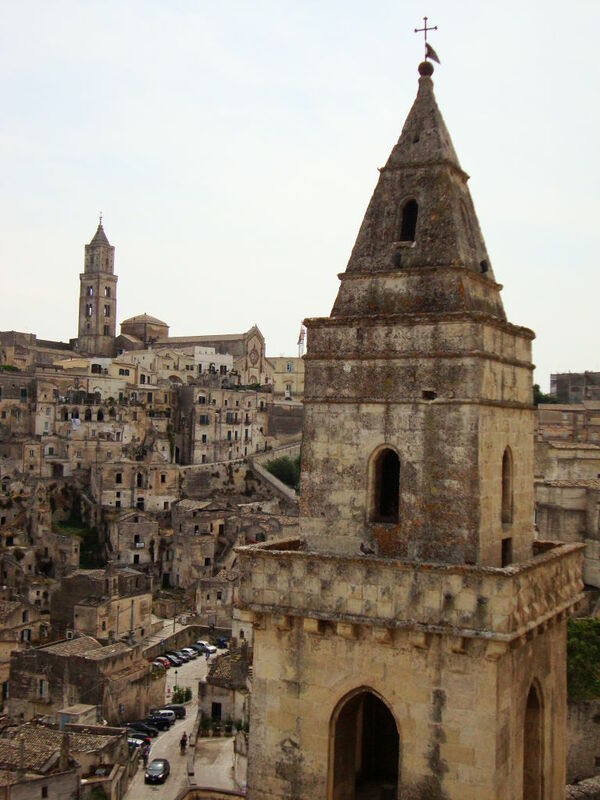 It’s name is Chiesa Santa Maria di Idris, it is almost completely dug inside the rock and it contains another hypogeal church, with amazing Byzantine frescoes (XII-XV century). 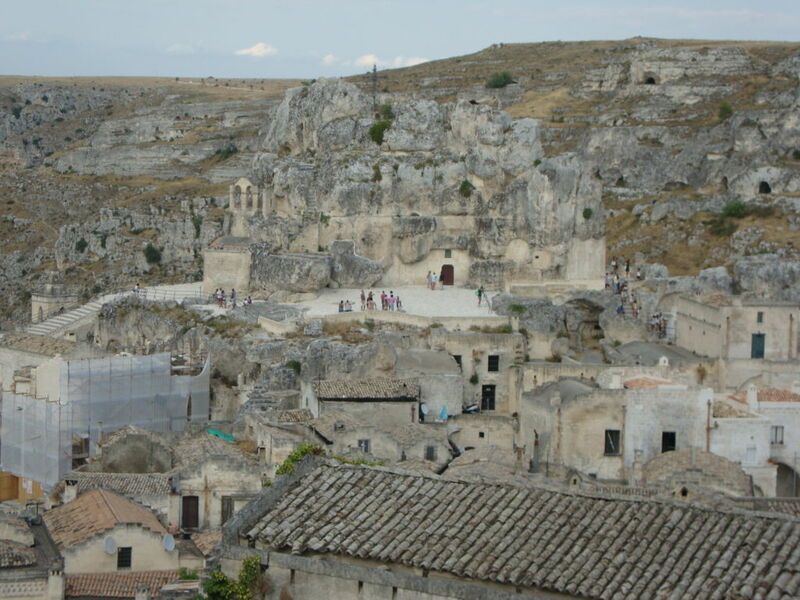 From the top of the “Sasso”, we look at the marvellous panorama, with all the cave-houses in an irregular row, sloping down deep. 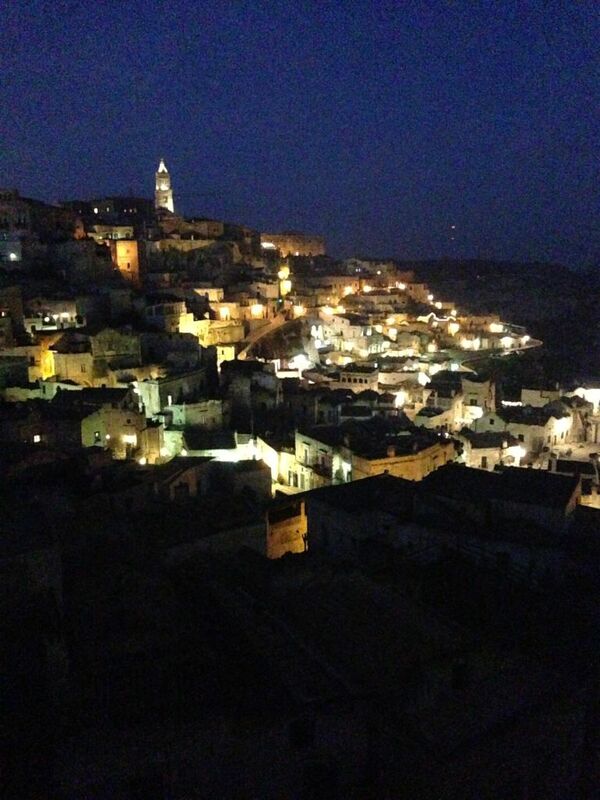 A writer from the 1500s described the “Sassi” as an upside down world, because at night people used to light their lamps, so those who were looking from above could see a starry sky below their feet! We go on walking down, through the labyrinth of alleys and we come across a series of terraces, which in the past were courtyards, hanging gardens or sometimes cemeteries. Today they belong to the many hotels and B&Bs, which have wisely maintained the old structures, characteristics and atmosphere. 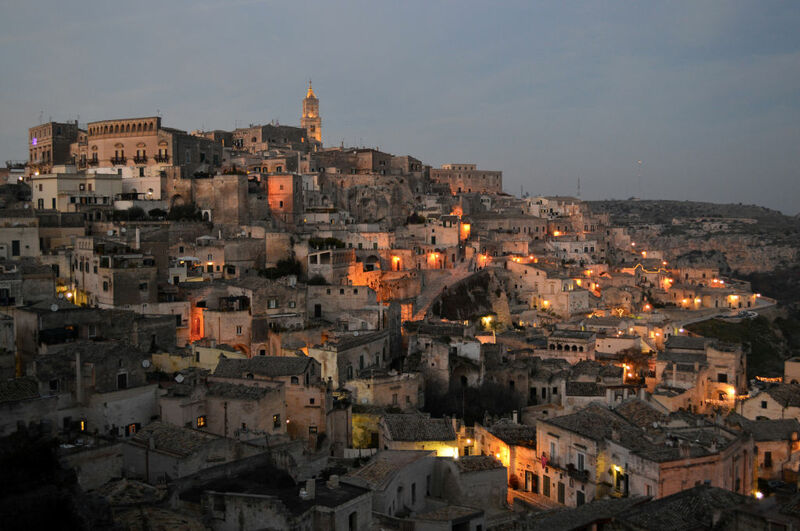 While we meander in the town centre during the sunset, Matera gives its best: yellow and warm lights are turned on all around the town, creating a charming, romantic and breathtaking landscape. We walk up to the Duomo (which is currently closed for renovations) and from the terrace where it stands, we are enchanted, looking at the “Sasso Barisano” all lit up, below us. So we think at how it could be in the past, when there was only candles and lamps to light the town and the call of the animals to break the silence.